Niels (Henrik David) Bohr (October 7, 1885 – November 18, 1962) was a Danish physicist who made fundamental contributions to understanding atomic structure and quantum mechanics, for which he received the Nobel Prize in 1922. He was also part of the team of physicists working on the Manhattan Project. Bohr married Margrethe Nørlund in 1912, and one of their sons, Aage Niels Bohr, grew up to be an important physicist, who like his father received the Nobel prize. Niels Bohr is widely considered one of the greatest physicists of the twentieth century. Niels Bohr is one of the most important scientists from Denmark; he is depicted on the front of the 500 Danish Kroner banknote and the Institute of Physics, founded by Bohr himself, at the University of Copenhagen is named after him. In the classical view of how two charged particles behave, an electron and a proton should stick together tightly. A hydrogen atom should be 100,000 times smaller than it actually is. Science, at the start of the twentieth century was in the embarrassing position of not having the least idea of just why matter was stable, as it clearly is. Bohr's great insight was to use Planck's quantum of action to define a small number of "allowed states" for the electron. The least-energy allowed state—or ground-state orbital as it is now called—spreads far from the proton. Thus the stability of matter. With this insight he was able to explain much that had previously been contradictory. He did not explain, however, just why these few states were allowed; that took another few decades and the insights of wave mechanics. Bohr's model. The theory that electrons travel in discrete orbits around the atom's nucleus, with the chemical properties of an element being largely determined by the number of electrons in its outer orbit. The idea that an electron could drop from a higher-energy orbit to a lower one, emitting a photon (light quantum) of discrete energy. This explained much of spectropscopy and became the basis for quantum theory). Much work on the Copenhagen interpretation of quantum mechanics. The principle of complementarity: That items could be separately analyzed as having pairs of contradictory properties. Examples being wave/particle, duration/energy, and position/momentum. He received the Nobel Prize for Physics in 1922 for his work. Niels Bohr as a young man. 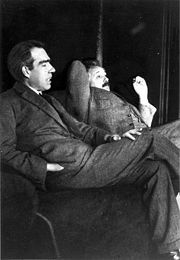 Niels Bohr and Albert Einstein. Niels Henrik David Bohr was born in Copenhagen, Denmark in 1885. His father, Christian Bohr, a devout Lutheran, was professor of physiology at the University of Copenhagen, while his mother, Ellen Adler Bohr, came from a wealthy Jewish family prominent in Danish banking and parliamentary circles. His brother was Harald Bohr, a mathematician and Olympic soccer player who played on the Danish national team. Niels Bohr was a passionate soccer player as well, and the two brothers played a number of matches for Akademisk Boldklub. Niels played in goal. Niels Bohr and Albert Einstein debating quantum theory at Paul Ehrenfest's home in Leiden (December 1925). Bohr was an undergraduate at Trinity College, Cambridge and then received his doctorate from Copenhagen University in 1911 under Christian Christiansen. He then studied under Ernest Rutherford at the University of Manchester, in England. On the basis of Rutherford's theories, Bohr published his model of atomic structure in 1913, introducing the theory of electrons traveling in orbits around the atom's nucleus, the chemical properties of the element being largely determined by the number of electrons in the outer orbits. Bohr also introduced the idea that an electron could drop from a higher-energy orbit to a lower one, emitting a photon (light quantum) of discrete energy. This became a basis for quantum theory. 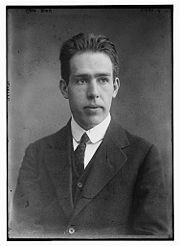 In 1916, Niels Bohr became a professor at the University of Copenhagen, and director of the newly constructed Institute of Theoretical Physics in 1920. In 1922, Bohr was awarded the Nobel Prize in physics "for his services in the investigation of the structure of atoms and of the radiation emanating from them." Bohr's institute served as a focal point for theoretical physicists in the 1920s and 1930s, and most of the world's best known theoretical physicists of that period spent some time there. Bohr also conceived the principle of complementarity: That items could be separately analyzed as having several contradictory properties. For example, physicists currently conclude that light is both a wave and a stream of particles—two apparently mutually exclusive properties—on the basis of this principle. Bohr also found philosophical applications for this daringly original principle. Albert Einstein much preferred the determinism of classical physics over the probabilistic the new physics of Bohr (to which Max Planck and Einstein himself had contributed). He and Bohr had good-natured arguments over the truth of this principle throughout their lives (see Bohr Einstein debate). One of Bohr's most famous students was Werner Heisenberg, a crucial figure in the development of quantum mechanics, who was also head of the German atomic bomb project. Niels Bohr and his wife Margrethe Nørlund had six children. Two died young, and most of the others went on to lead successful lives. 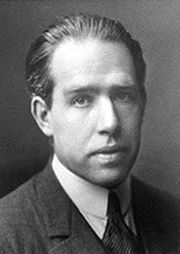 One, Aage Niels Bohr, also became a very successful physicist; like his father, he won a Nobel Prize. 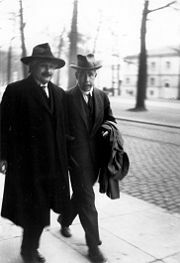 In 1941, during the German occupation of Denmark in World War II, Bohr was visited by Heisenberg in Copenhagen . In 1943, shortly before he was to be arrested by the German police, Bohr escaped to Sweden, and then traveled to London. He worked at the secret Los Alamos laboratory in New Mexico, on the Manhattan Project, where, according to Richard Feynman, he was known by the assumed name of Nicholas Baker for security reasons. His role in the project was important. He was seen as a knowledgeable consultant or "father confessor" on the project. He was concerned about a nuclear arms race, and is quoted as saying "That is why I went to America. They didn't need my help in making the atom bomb." Bohr believed that atomic secrets should be shared by the international scientific community. After meeting with Bohr, J. Robert Oppenheimer suggested Bohr visit President Franklin Roosevelt to convince him that the Manhattan Project should be shared with the Russians in the hope of speeding up its results. Roosevelt suggested Bohr return to England to try to win British approval. Churchill disagreed with the idea of openness towards the Russians to the point that he wrote in a letter: "It seems to me Bohr ought to be confined or at any rate made to see that he is very near the edge of mortal crimes". After the war, Bohr returned to Copenhagen, advocating the peaceful use of nuclear energy. He died in Copenhagen in 1962. He is buried in the Assistens Kirkegård in the Nørrebro section of Copenhagen. The element bohrium is named in his honor. In 1965, three years after Bohr's death, the Institute of Physics at the University of Copenhagen changed its name to the Niels Bohr Institute. It is generally accepted that Bohr read the nineteenth century Danish philosopher Søren Kierkegaard. Richard Rhodes argues in The Making of the Atomic Bomb that Bohr was influenced by Kierkegaard via the philosopher Harald Høffding, who was strongly influenced by Kierkegaard and who was an old friend of Bohr's father. In 1909, Bohr sent his brother Kierkegaard's Stages on Life's Way as a birthday gift. In the enclosed letter, Bohr wrote, "It is the only thing I have to send; but I do not believe that it would be very easy to find anything better…. I even think it is one of the most delightful things I have ever read." Bohr enjoyed Kierkegaard's language and literary style, but mentioned that he had some "disagreement with [Kierkegaard's ideas]." Given this, there has been some dispute over whether Kierkegaard influenced Bohr's philosophy and science. David Favrholdt argues that Kierkegaard had minimal influence over Bohr's work; taking Bohr's statement about disagreeing with Kierkegaard at face value, while Jan Faye endorses the opposing point of view by arguing that one can disagree with the content of a theory while accepting its general premises and structure. Bohr and Werner Heisenberg enjoyed a strong mentor/protégé relationship up to the onset of World War II. Heisenberg had made Bohr aware of his talent during a lecture in 1922 in Göttingen. During the mid 1920s Heisenberg worked with Bohr at the institute in Copenhagen. Heisenberg, as most of Bohr's assistants, learned Danish. Heisenberg's uncertainty principle was developed during this period. Bohr's complementarity principle likewise. By the time of WWII, the relationship became strained because, among other reasons, Bohr, with his Jewish heritage, remained in occupied Denmark, while Heisenberg remained in Germany and became head of the German nuclear efforts. Heisenberg made a now-famous visit to Bohr in September/October 1941, and during a private moment, it seems that he began to address nuclear energy and morality as well as the war effort. What was said is a matter of scholarly debate as neither Bohr nor Heisenberg spoke about it in any detail to outsiders nor left written records of this part of meeting at the time, and they were alone and outside. Bohr seems to have reacted by terminating that conversation abruptly thereby not giving Heisenberg any hints in any direction. While some suggest that the relationship became strained at this meeting, other evidence shows that the level of contact had been reduced considerably for some time already. One source, Heisenberg himself, suggests that the fracture occurred later. In correspondence to his wife, Heisenberg described the final visit of the trip: "Today I was once more, with Weizsaecker, at Bohr's. In many ways this was especially nice, the conversation revolved for a large part of the evening around purely human concerns, Bohr was reading aloud, I played a Mozart Sonata (A-Major)." The British intelligence services inquired about Bohr's availability for work or with insights of particular value. Bohr's reply made it clear that he could not help. This reply, just as his reaction to Heisenberg, made sure that, if Gestapo intercepted anything attributed to Bohr it would simply point to no particularly relevant knowledge regarding nuclear energy, as it stood in 1941. This does not exclude the possibility that Bohr privately did make calculations going further than his work in 1939 with Wheeler. After leaving Denmark in the dramatic day and night (October 1943) when most Jews were able to escape to Sweden due to a series of very exceptional circumstances, Bohr was quickly offered, again, to join British efforts and he was flown to the UK for that purpose. He was evacuated from Stockholm in 1943, in an unarmed De Havilland Mosquito bomber (carried in an improvised cabin in the bomb bay) sent by the RAF. The flight almost ended in tragedy as Bohr did not don his oxygen equipment as instructed, and passed out. He would have died had not the pilot, surmising from Bohr's lack of response to intercom communication that he had lost consciousness, descended to a lower altitude for the remainder of the flight. Bohr's comment was that he had slept like a baby for the entire flight. As part of the UK team on "Tube Alloys" Bohr was also included at Los Alamos. Oppenheimer credited Bohr warmly for his guiding help during certain discussions among scientists there. Discreetly, he met Roosevelt and later Churchill to warn against the perilous perspectives that would follow from separate development of nuclear weapons by several powers rather than some form of controlled sharing of the basic scientific knowledge, which would spread quickly in any case. Only in the 1950s, after the immense "surprise" that the Soviets could and did in fact develop the weapons independently, was it possible to create the IAEA along the lines of Bohr's old suggestion. In 1957, while the author Robert Jungk was working on the book Brighter Than a Thousand Suns, Heisenberg wrote to Jungk explaining that he had visited Copenhagen to communicate to Bohr his view that scientists on either side should help prevent development of the atomic bomb, that the German attempts were entirely focused on energy production, and that Heisenberg's circle of colleagues tried to keep it that way. However, Heisenberg acknowledged that his cryptic approach of the subject had so alarmed Bohr that the discussion failed. Heisenberg nuanced his claims, though, and avoided the implication that he and his colleagues had purposely sabotaged the bomb effort. However, this nuance was lost in Jungk's original publication of the book, which strongly implied that the German atomic bomb project was rendered purposely stillborn by Heisenberg. When Bohr saw Jungk's erroneous depiction in the Danish translation of the book, he disagreed wholeheartedly. He wrote—to Heisenberg, but never sent it—that while Heisenberg had indeed discussed the subject of nuclear weapons in Copenhagen, Heisenberg never alluded to the fact that he might be resisting efforts to build such weapons. Bohr dismissed the idea of any pact as an after-the-fact construction. Michael Frayn's play Copenhagen, which was performed in London (for 5 years), Copenhagen, Gothenburg, Rome, Geneva, and on Broadway in New York, explores what might have happened at the 1941 meeting between Heisenberg and Bohr. Frayn points in particular to the onus of being one of the few, or the first one, to understand what it would mean in practice to create a nuclear weapon. "And anyone who thinks they can talk about quantum theory without feeling dizzy hasn't yet understood the first thing about it." "If quantum mechanics hasn't profoundly shocked you, you haven't understood it yet." "Nothing exists until it is measured." "A triviality is a statement whose opposite is false. However, a great truth is a statement whose opposite may well be another great truth." "How wonderful that we have met with a paradox. Now we have some hope of making progress!" "Einstein, stop telling God what to do." Sometimes quoted including: "…with his dice." Alternate version: "Don't you think caution is needed when using ordinary language to ascribe attributes to God?" "The complement of truth is clearness." "It is very difficult to make an accurate prediction, especially about the future." "Never talk faster than you think." "There are some things so serious you have to laugh at them." "It is wrong to think that the task of physics is to find out how nature is. Physics concerns what we can say about nature." When awarded the Order of the Elephant by the Danish government, he designed his own coat of arms which featured a yin-yang. The Bohr models semi centennial was commemorated in Denmark on November 21, 1963, with a postage stamp depicting Bohr, the hydrogen atom and the formula for the difference of any two hydrogen energy levels: . Bohrium (a chemical element, atomic number 107) is named in honor of Niels Bohr. The Centennial of Bohr's birth was commemorated in Denmark on October 3, 1985, with a postage stamp depicting Bohr with his wife Margrethe. On September 24, 2003, the Danish National Bank started circulating the danish five-hundred-kroner bill with the portrait of Niels Bohr smoking a pipe. Planck thought, in error, that the conservation of energy did not apply to beta decay. It was Pauli instead who took the radical step of introducing a new and elusive particle, the neutrino. Bohr, N. 1913. On the Constitution of Atoms and Molecules, Philosophical Magazine. 6:26:1-25. Retrieved August 10, 2007. ↑ Doug Long, Niels Bohr—The Atomic Bomb and beyond. Retrieved August 10, 2007. ↑ Richard Rhodes, The Making of the Atomic Bomb (New York: Simon & Schuster). ISBN 0684813785. ↑ Bryan Register, Complementarity: Content, Context and Critique. Retrieved August 10, 2007. ↑ David Favrholdt, Niels Bohr’s Philosophical Background (Copenhagen: Munksgaard, 1992). pp. 42-63. ↑ Werner Heisenberg, Letter from Werner Heisenberg to his wife Elisabeth written during his 1941 visit in Copenhagen. Retrieved August 10, 2007. ↑ Finn Aaserud, Release of documents relating to 1941 Bohr-Heisenberg meeting, Niels Bohr Archive. Retrieved August 10, 2007. Niels Bohr on the 500 Danish Kroner banknote. Annotated bibliography for Niels Bohr from the Alsos Digital Library for Nuclear Issues. The Bohr-Heisenberg meeting in September 1941. This page was last modified on 4 December 2018, at 00:08.